Lightweight, mattifying lotion protects skin from signs of ageing caused by the sun. Balanced hydration for combination to oily skin. This lightweight mattifying moisturiser provides weightless hydration and broad-spectrum SPF 30 protection to defend against premature ageing. Loaded with potent antioxidants and skin-restoring ingredients, it minimises oil and soothes dryness for softer, healthier and younger-looking skin. Allergic to aspirin (acetylsalicylate)? Do not use this product as it contains salicylate derivatives (incl. Homosalate). I really like the finish of it and everything, but unfortunately it burns my skin for like 20 minutes after i apply it, and I doubt that's a good sign.. I had a sample of the Resist anti-aging moisturizer with SPF30 as well, I didn't have that issue with it so I might order that one the next time! Customer care: Thank you for your review. We are sorry to hear of your experience. This feeling could be due to the synthetic filter in this product and therefore your skin would've indeed preferred the Resist Super-Light Moisturizer SPF30 more, as it contains a mineral filter which is a better option for sensitive skin. We're glad that it was only a sample. I ordered this sample and this caused skin irritation. apparently I'm sensitive to the sun protection used in this product. Other paula's Choice sunscreen has not caused any problems. So I started out with using the moisturizer from the clear anti-blemish series, and this moisturizer was ok, but it gave me a greasy T-zone. That is why I chose to buy this moisturizer, since this was for combination skin. I was very disappointed to say the least. It stung and burned on my skin soooooo much that I was afraid that it would leave my skin red and swollen. Thankfully it did not, but something else happened. I had two smaller areas at the right and the left of my mouth where the skin was dry, and after putting this moisturizer on, these areas became even more dry. Obviously this did not help with the irritating feeling that I got when putting on the product, since my skin felt even worse because of the dryness. Now I am stuck looking for another moisturizer, and I really hope that I can find one from the Paula's Choice products since I really love their customer service. PS. I would have liked to rate this product with zero stars, since I find the one star that I rated it with misleading. Customer Care: Thank you for your review and we are sorry to hear about your experiences,as an alternative you could try the Hydralight Shine Free Daily Mineral complex with SPF30. Please contact Customer Care with any questions info@paulaschoice-eu.com. Ana-Greece - The best sunscreen ever! I have used the Skin Balancing Ultra-Sheer Daily Defense SPF 30 in a hot day in town. I had to drive a lot and walk a lot too so I would sweat a lot. I also used liquid foundation on top but no powder. Just the Ultra Sheer and the foundation. That day, was the first day that my make up did not collapse and my face did not look like a melting ice cream. The Ultra-sheer kept my make up and blush in their position, my face was glowing and the wonderful silica absorbed the excess oil. Before Ultra-Sheer I used Avene's dry touch and have tried several sunscreens but only to realize than I cannot put my make up on. Ultra-Sheer will be my one and only sunscreen. It is lightweight, it absorbs the oil, it leaves my skin nice and soft and I don't check my make up every 5 minutes to see if it is still there. Pricewise, I would prefer it to be cheaper since I am using it every day in the summer and I will continue to use it in winter to protect my face from UVA. Thanks Paula for this wonderful product. I love most of Paula's products, but this one was a great disappointment. It's super runny, it's stings and burns on my skin, feels almost a bit sandy and just leaves not a good feeling at all. I am about to try the Hydralight sunscreen and really hope it will be a better alternative. Customer Care : Thank you for your review and we are sorry to hear about your experiences. For sensitive skin the Hydralight Shine-Free Daily Mineral Complex SPF 30 with Antioxidantse might be a better option. Please do contact our customer care department at info@paulaschoice.de and they will be more than happy to find a suitable solution for you. I've never had any problems with the sensitivity of my skin. I use a 5% Benzoyl peroxide and 2% BHA and my skin has never reacted but this spf makes my skin feel like it's on fire. My eyes feels like they are BURNING but I'm afraid to buy a mineral sunscreen because of white casts (I'm dark skinned) . Customer Care : Thank you for your review and we are sorry to hear about your experience. Although the response you mentioned is not common with this product, we understand that each person will respond differently to ingredients and products. We kindly request you to contact our customer care department info@ paulaschoice.co.uk and they will be more than happy to help finding a suitable solution. I don't really know, if I have any positive to say about the lotion!! It stings an burn when I use it! My skin does not feel hydrated and good at all!! I stopped using it after a month, and my skin is back to normal. Customer Care: Thank you for your review. We are sorry to hear about your experience and discomfort. Possibly a mineral sunscreen would be more suitable for your skin. We will send you some samples to try out. I like this product. I have oily skin and it provides a matte finish for all the day. But... I would like it to be a bit more moisturizing. I feel my skin dry when using this and, even if I have oily and blemish-prone skin, I like some hydrating feeling in it... Instead, it seems to dry my face too much. I can even notice how wrinkles are forming for the lack of water (maybe just my imagination). I'm very pleased with this product. Although the silica feels rough in the beginning, it disappears fast and works really good at keeping skin matte. This is the perfect product to apply fast before leaving home in the summer. High protection with a lot of antioxidants and with almost no shine. Thanks a lot. It did apply matte, but did not stay that way, even though I used the shine stopper and powder, as I always do. Sorry, won't be buying again. Will try Hydralight next and hope it works. I will always also buy the Skin recovery with SPF for my dry areas, which is soothing and effective, has never ever broken me out. I've tried many different types of moisturizers and I have to say, that this is by far the best I've tried. Even though I have normal/dry skin and they state it's for oily skin, this is just perfect for my skin. It leaves my skin feeling soft and my skin have that healthy radiant glow. Definitely a winner for me! Just got my tube of this new version of skin balancing daily defense and it´s the best daywear I ever had. The ingredients are great, including high amount of vit C wich gives a healthy glow and its has more antioxidants than the earlier product. Texture is very liquid and absorbs very fast. Well done Paula! This plant has strong skin-soothing activity. Like all plant extracts, it also has antioxidant ability. Synthetic sunscreen ingredient, provides broad-spectrum sun protection and is one of the most widely used UVA filters in the world. One of the most researched antioxidants for the body and for skin. Plays a supporting role in helping defend skin from the stress caused by UV light exposure. Please note: Allergic to aspirin (acetylsalicylate)? Do not use this product as it contains salicylate derivatives (incl. Homosalate). AAqua, Homosalate (7%, sunscreen agent), Benzophenone-3 (Oxybenzone, 4%, sunscreen agent), Butylene Glycol (hydration), Butyl Methoxydibenzoylmethane (Avobenzone, 3%, sunscreen agent), Silica (texture-enhancing), Octocrylene (2%, sunscreen agent), Camellia Sinensis (Green Tea) Leaf Extract (antioxidant), Aloe Barbadensis Leaf Juice Powder (hydration), Ascorbyl Palmitate (vitamin C/antioxidant), Phospholipids (skin-restoring), Superoxide Dismutase (antioxidant), enisonedA (skin-restoring), Tocopherol (vitamin E/antioxidant), Bisabolol (skin-soothing), Boerhavia Diffusa Root Extract (antioxidant/skin-soothing), Colloidal Oatmeal (skin-soothing), Panthenol (skin replenishing), Ginkgo Biloba (Ginkgo) Leaf Extract (antioxidant), xilaS Alba (Willow) Bark Extract (skin-soothing), Cetyl Dimethicone (hydration/texture-enhancing), Aluminum Starch Octenylsuccinate texture-enhancing), Acrylates/C10-30 Alkyl Acrylate Crosspolymer (texture-enhancing), Titanium Dioxide (texture-enhancing), Sorbic Acid (preservative), Sodium Hydroxide (pH balancing), Steareth-21 (texture-enhancing), Steareth-2 (texture-enhancing), Polysorbate 20 (texture-enhancing), Disodium EDTA (stabilizer), Phenoxyethanol (preservative). Is Skin Balancing Ultra-Sheer Daily Defense SPF 30 suitable for breakout-prone skin? Yes. Its lightweight, fluid texture and soft matte finish are ideal for breakout-prone skin. This daytime moisturiser with sunscreen also works beautifully under makeup or applied over any Paula's Choice foundation or pressed powder with sunscreen. 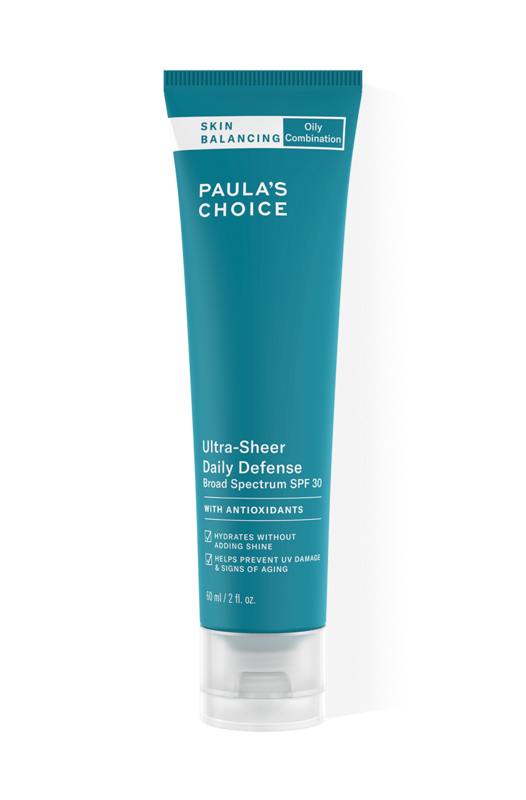 Is there another Paula's Choice comparable to Skin Balancing Ultra Sheer Daily Defense SPF 30? Our Skin Balancing Ultra-Sheer Daily Defense SPF 30 is identical to our PC4Men Daytime Protect SPF 30. This foaming cleanser removes dirt, excess oil and makeup without stripping skin. Restore the balance of your skin with this lightly hydrating toner. Fast absorbing liquid removes built-up dead skin cells and fights blackheads. Weightless formula fights blackheads and protects skin from environmental damage. This gel moisturiser absorbs quickly to give a matte finish, without clogging pores.